The KY-PZ100 is a robotic pan, tilt and zoom video production camera. It's the first PTZ camera that features JVC's unique IP communications engine providing network connection via WiFi*, 4G-LTE*, or cabled LAN. It's designed to be used as a stand alone remote camera or as part of a multi-camera system in both studio and field environments. In addition to its 3G-SDI and HDMI outputs, it is also capable of reliably streaming 1080i/60, 1080p, 720p, and 360p video with 2-channel audio--all with minimal latency and forward error correction. Camera control is possible from a web browser, or with the dedicated RM-LP100 remote control panel, or from a variety of remote units using standard protocol. The camera also includes on-board HD recording at up to 50Mbps to a micro SDHC/SDXC card with the ability to upload the recorded files to an external server. The KY-PZ100 features JVC's highly accurate direct drive mechanism for smooth, quiet and precise positioning with up to 100 preset positions. Positioning can be performed at a range of speeds from very very slow to very fast while retaining pin-point accuracy (within 0.03°). A newly developed 1/2.8-inch image sensor and 30x optical zoom lens produce superb broadcast quality images even in low light environments. The camera's Wide Dynamic Range mode provides clear natural foreground images even under challenging highlight conditions. Power the camera, control it, and stream to the world all from a single ethernet cable. Or go wireless. Just provide power to the camera, plug in a WiFi adapter or LTE modem, and you'll have the world's most convenient, high quality robotic camera that can be placed virtually anywhere, stream full HD, and be controlled from anywhere in the world! 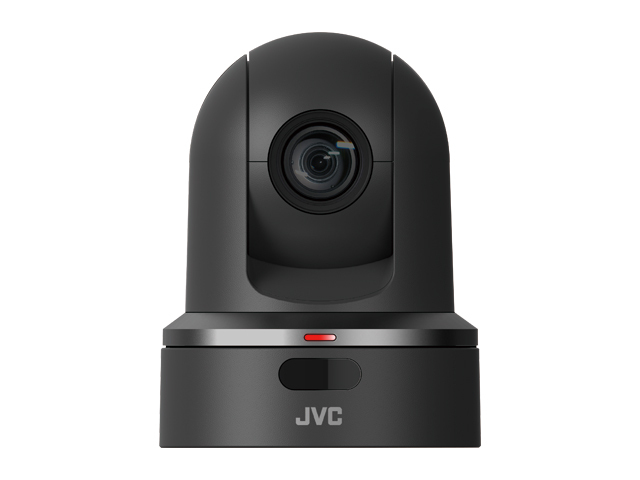 The KY-PZ100 is the PTZ camera that features JVC’s unique IP communications engine providing network connection via Wi-Fi*, 4G/LTE*, or wired LAN. *Wi-Fi and 4G/LTE require optional network adapter. Using a browser, video monitoring and remote camera control can be performed with a PC from all over the world. RTMP protocol support enables direct streaming to JVC VIDEOCLOUD, Ustream, YouTube, Facebook, etc. Other various protocols and bitrates are supported for a variety of usages. In High-Sensitivity mode, minimum illumination is 0.02 lx. Superior color reproduction is ensured even at low light. The Night Mode is also available for even darker environments (0.003 lx of minimum illumination). Equipped with 30x optical zoom, the KY-PZ100 is capable of capturing distant subjects. Even in a grand hall or auditorium, the speaker’s expressions and handwriting on a board will be clearly captured. 12x digital zoom is also available. The KY-PZ100 incorporates JVC’s Direct Drive Motor that offers precise, highly responsive pan/tilt and silent movement compare to the normal stepping motor mechanism. Super Fast Pan/Tilt of max. 480°/sec*. With maximum 480°/sec*. movement offers the scene transition sharply. *In case with AC adapter. 400°/sec. with PoE+. Super Slow Pan/Tilt of min. 0.1°/sec. Extremely slow movement of 0.1°/sec. offers a good look at the scene even at high zoom rates. Operating noise of Direct Drive is approx. 20% lower than normal stepping motor system, which is especially suitable for the usage of classic concert, church and so on. Adjusts to preset positions with high accuracy, offset less than 0.03°. Maintains precise shooting positions even at high magnification with virtually no deviation. Simultaneous digital output capability, with up to1920x1080/60p video through 3G-SDI/HDMI/IP, makes the KY-PZ100 ideal for webcasting as well as viewing and recording of conferences, lectures, and other live events. You can reduce installation cost with the KY-PZ100 that supports PoE+ (Power-over-Ethernet), which is capable of carrying IP video, audio control and power over a single connection cable. The Wide Dynamic Range mode provides clear natural foreground images even under challenging highlight conditions. The KY-PZ100 offers progressive video recording of 1920x1080/50p, 60p at 50Mbps and streaming of 1920x1080/50p, 60p at 20Mbps. Input audio through a microphone or a mixer can be IP output and embedded on SDI or HDMI output. The KY-PZ100 features a built-in digital recorder that records HD from 5Mbps to 50Mbps directly to microSDHC/microSDXC card. Recordings can be uploaded from the camera to an external server. Up to 100 points of PTZ positons and other settings such as focus and white balance can be memorized on the camera. Thanks to SMPTE 2022-1 and Zixi* support, reliable and stable streaming is assured with forward error correction. Especially with Zixi protocol, even more reliable streaming is ensured with adaptive bit rate and automatic repeat request. *Requires optional Zixi licensed decoder or server. Autofocus and image stabilization built-in.